What The #1 Thing A Product Manager Needs In Order To Launch A Product? The problem that all too many product managers run into when it comes to launching a product is — just exactly when to do it? What happens is that the product managers start off by doing what we all do: creating the product. This is a busy time and it can be very easy for us to spend our time focusing on what is going on inside of the company. Generally speaking, many product managers wait until they are roughly between 3-6 months away from launching their product before they really get serious about how they are going to launch it. The problem with doing this is that by doing this we ignore what our customers may be telling us about our product. This is not going to look good on our product manager resume. The problem with this approach is that by this time you have already made a significant investment in your product. This means that you are going to go ahead with the launch no matter what – you have to! This then requires that the company come up with the funding that a proper launch of the product is going to require, and that’s where the problems can start. 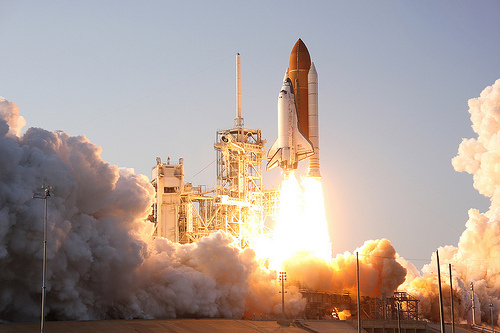 So what’s the right way to go about doing a product launch? The secret is that when your firm decides that it wants to investigate creating a new product (or a new version of an existing product) and starts to create a product development definition, that is the day that planning for the product launch needs to start to happen. In Blue Elephant’s $TOMP product management system, the very first few steps in the product management process have to do with collecting customer information that will eventually be used during the product launch. One of the most important things that product managers need to realize is that a product launch is going to cost money. This means that everyone in the firm has to be on board and understand that if they want the product to be a success, then they’ve going to have to be committed to spending the money to do the launch the right way. With a little luck your product will eventually be a big success; however, you’re going to have to be committed enough to it to launch it in the right way for this to happen. Just creating a great product is not enough for a company or a product manager to be successful, you also need to do a good job of launching the product. This may not have been covered on your product manager job description, but launching a product the right way is not an easy thing to do and unless you give it the time and attention that it requires, you can screw it up. All too often companies spend most of their time creating the product in the first place. They then try to quickly throw together a product launch plan. The right way to go about doing this is to plan for the product launch from the beginning. The Blue Elephant $TOMP product management system does this by having the product manager understand who their customer is and what they’ll be using the product for long before the product development starts. The next time that you are involved with a product, start to consider how you’ll want to go about launching it from the start of the project. Understand both the time and the expense that will be involved in going about doing a product launch the right way. If you can do this, then all of the time that was spent creating the product can pay off for everyone who is involved. Question For You: Do you think a separate team needs to be set up to handle all of the product launch details? Welcome to the crazy world of social media. You know, the market segment where one day there’s nothing and then the next day there’s a brand new company that is worth billions. The story of Instagram is just like this. This photo sharing social media hub came out of nowhere and ended up being bought by Facebook for US$1 billion. Now comes the hard part: how will Instagram’s product managers change things so that Instagram can start to make money…? Product Manager Would You Sleep With Your Customer If They Offered You $1M Order?